• Da’esh represents a compound threat: it is both the organization and the violent extremist idea it represents. • Da’esh battlefield loss in Iraq/Syria theater will not bring about an end to the salience of the extremist ideology that it represents. Rather, the “ideological battle” is likely to continue over the coming years with potentially unacceptable tolls on Western societies. • The effort to mitigate the threat should be compound and comprehensive: addressing the regional conflict as a whole, not Da’esh only, using targeted kinetic options along with complementary messaging and other non-kinetic options. • shaping and influencing narratives to minimize Da’esh appeal. OBSERVATION: There are at least eight inter-related militarized conflicts in the region. US focus on Da’esh in Iraq and Syria has weakened Da’esh but, by not addressing other regional conflicts, has allowed extremist ideology to become further entrenched. OBSERVATION: Da’esh’s caliphate-state concept, the appeal of jihadism, and terrorist tactics are unlikely to disappear in the near term. However, we may be able to impact their appeal to aggrieved populations and diminish their lethality. RESEARCH FINDING: Violent and repressive counter VEO efforts increase the incidence and lethality of VEO responses; non-violent approaches appear to make groups less lethal (See Asal, Rethemeyer and Young, page 22). • Defeating Da’esh the organization with overt kinetic and violent means will at best diminish a portion of the threat and leave the region in persistent turmoil. • building trust with elite/ leader networks in secret, over time, using rewards, and withholding punishments in order to accommodate acceptable elements of the larger movement of which Da’esh is part. RESEARCH FINDING: Based on the range of interests (i.e., economic, social, domestic, etc.) of regional actors, Da’esh eventually will be defeated regardless of US efforts in Syria. The interests of regional actors that possess the relevant capabilities to impact the fight against Da’esh show high resolve for defeatist defeat in Syria and even more so for Da’esh defeat in Iraq. RESEARCH FINDING: Whether Iraqi tribal elites and Sunni factions perceive that there range of interests are better served b the Government if Iraq (GoI) or living under Da’esh/jihadist rule is determined by what they believe about the security conditions that each would bring. 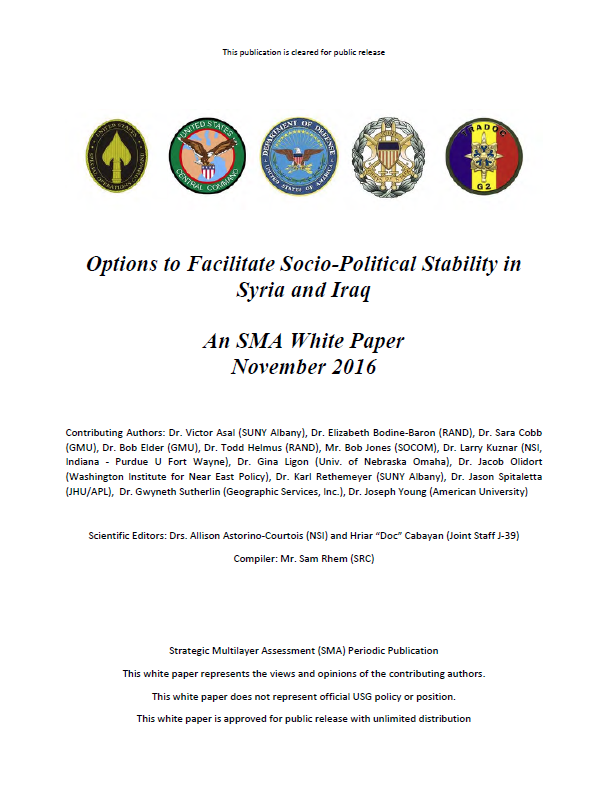 RESEARCH FINDING: Given their range if interests, the benefit Kurdish groups derive from continued civil conflict in Syria and Iraq (e.g., wealth, prestige, territory) can be countered with economic arrangements, and enhanced international and domestic influence. RESEARCH FINDING: GoI and Shi’a hardliners in Iraq have high resolve (political will) to avoid making substantive post-conflict political reforms that increase the stature of Sunni voices in the Iraqi government. Two conditions however change the decision calculus of each groups to preferring to make these reforms: 1) outbreak of full-scale civil warfare in Iraq; or 2) Iranian backing for such reforms. IMPLICATIONS: Now is the opportune time to shift policy towards conflict transformation – avoiding civil war in Iraq; begin engaging all parties in publically visible dialogue regarding their views and requirements for post-Da’esh governance and security. • Incentivize Iran to back off on proxy funding, diminish stridency of Shi’a hardline easing way for GoI to make substantive overtures, open governance reform talks. RESEARCH FINDING: The regional system will remain unstable; defeat of Da’esh decreases system conflict only marginally. RESEARCH FINDING: Saudi, Iranian use of proxy forces can quickly reignite hostilities in the region. Although direct confrontation is very costly for each, the chances of unwanted escalation are high. RESEARCH FINDING: Iran may be incentivized to limit proxy support by international efforts to 1) recognize Iran as a regional partner, 2) mitigate perceived threat from Saudi Arabia and Israel, and 3) expand trade relations with Europe. RESEARCH FINDING: There are few potential levers incentivizing Saudi Arabia to limit proxyism, although it may respond to warning of restrictions on US support if not curtailed. IMPLICATIONS: To be effective, efforts to address the underlying sources of regional instability should include a shift from a narrow focus on Da’esh toward the multiple active and latent conflicts in the region, most notably the Saudi-Iranian, Sunni-Shi’a rivalry. Activities should include open dialogue with Iran, Saudi Arabia and regional actors to quell the intensity of Saudi-Iran rivalry and mutual threat perceptions. OBSERVATION: The regional population is traumatized and wrought with PTSD. Both civilians and combatants are physically and psychologically wounded. OBSERVATION: Regional actors are using the fight against Da’esh as an excuse to fight others with whom they have long-standing animosities. OBSERVATION: As populations continue to be disaffected, Da’esh gains empathy, nationstates find avenues to either directly assault or use proxies to undermine adversaries, and US interests are curtailed. IMPLICATIONS: Address population grievances, not jihadist ideology independent of context. Sincerely addressing disaffection of regional populations – physical, social and political — makes conditions unfavorable for both the Da’esh organization and the ideology. It also sets the context for diminishing the allure of violent extremist ideology, civil conflict, and ultimately regional stability. Activities should include instituting immediate humanitarian relief for disaffected population will help ease trauma and facilitate overdue care for those wounded by all warring parties in this conflict, and development of long-term plans for dealing with IDPs, refugees and returnees.